TURQUIE – Limyra - Archaeological teams digging in the ancient city of Limyra in the Mediterranean province of Antalya have announced the discovery of a second synagogue from the Lycian civilization. Researchers initially thought the house of worship was a glass furnace, according to the head of the excavations, Dr. Martin Seyer of the Austrian Archaeology Institute. “We first found a bath and a menorah. After some [further] investigation, we found out that it was a synagogue,” he said. The synagogue in Limyra, which is located in Turunçova in Antalya’s Finike district, is the second to be found in the historical Lycian region after one discovered in 2009 in the ancient city of Myra in Antalya’s Demre district. Limyra was the former capital of the Lycian Federation, which some have called the first democratic union. 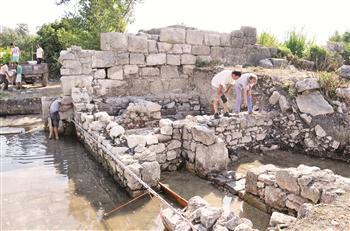 “We have excavated a small part of the synagogue field, but we think that the synagogue was on a very large field,” he said, citing the relevant law under Emperor Theodosianus that only permitted the restoration of existing synagogues rather than the construction of new Jewish houses of worship. “There was a wide and rich Jewish group of people living there. The synagogue is a very important discovery for Jews and the ancient city of Limyra. Thanks to this synagogue, we have chance to see the Limyra excavations and its history.” Excavations will continue in the area around the synagogue next year, Seyer said, adding that the ancient city would attract many more tourists once the archaeological work is complete. IRAK – Abu Rabab - A group of Iraqi archaeologists have recently managed to unearth artifacts and a Babylonian temple’s structure dating back to the middle Babylon period between 1532 BC to 1000 BC at an archaeological site in Iraq’s southern province of Nassiriya. The site, excavated at 500 square meter at Abu Rabab plateau and located 150 km in east of Nassiriya city, is part of a project called “Gardens of Eden” which Iraqi government plans to launch over the next few years to promote tourism in the province. “There are many archaeological sites in this region including the ancient archaeological plateaux that was excavated as part of the marshes project, the archaeological site of Abu Rabab, Abu al-Dhahb, Abu Massaed site, and other archaeological plateaux. Now we are working in four archaeological plateaux that are located near the province and near the marshes. 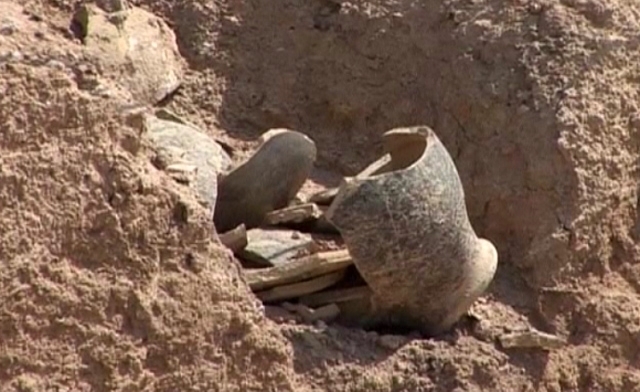 The work is being done in this area because the site is close to the province, and water does not leak in the archaeological plateaux,” said Iyad Mahmoud, Archaeologist and director of archaeological team. Some valuable artifacts and relics were discovered during the site excavations. “We have unearthed two buildings, the building units could be a Babylonian temple. 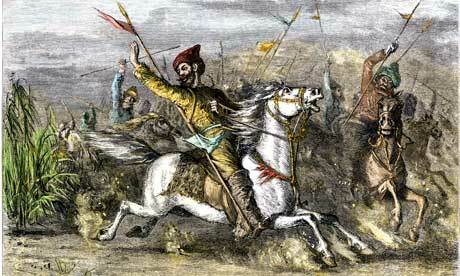 Artifacts, including jars, clay tablets, cylinder and flat stamps, were also discovered near the site,” Mahmoud added. Thousands of priceless relics were looted from Iraq’s museums and archeological sites in the mayhem that followed the U.S.-led invasion that ousted Saddam Hussein in 2003. Some 15,000 artifacts were thought to have been looted from the Iraqi National Museum and thousands more from archeological sites since the start of the 2003 war. Mahmoud pointed out that financial backing is the key problem that hinders excavations in Nassiriya. MONGOLIE - The Mongol empire in the 13th century conquered great swaths of Asia, the Middle East and even parts of Europe at staggering speed, but how did Genghis Khan and his armies manage to conquer so much and so fast? The answer may lie in some ancient dead trees found recently in an old volcanic lava flow in Mongolia. The trees were so well preserved that their annual growth rings were still visible and gave an astonishing insight into the climate of the 1200s. The wood rings were spaced wide apart showing that the trees grew well, thanks to plenty of rain. And because the trees did well, the chances are that the grasslands of the vast Mongolian plains also grew lush in the wet climate. Those rich grasslands would have fuelled the Mongol armies, giving plenty of grazing land for the thousands of horses that the troops relied on, and livestock to feed the soldiers. But the tree rings also showed a sudden lurch into much colder, drier conditions around 1258, when the trees hardly grew. This was around the time the Mongol empire began to fall apart and the Mongols moved their capital into what is now Beijing. It was part of a global climate event, and a recent archaeological dig in London revealed that a catastrophic famine struck England at the same time, leading to thousands of deaths. The downturn in climate was caused by a massive volcanic eruption that blanketed the globe in ash and cut down sunlight across the world. CANADA – Moncton – Archaeologists searching for First Nations artifacts at the Moncton airport are wrapping up their dig. The work was being done to preserve any artifacts before a new runway at the airport is built. Archaeologists dug close to 700 holes looking for evidence that aboriginal people used the area hundreds of years ago. Albert Ferguson, the manager of archaeological services for the provincial government, said in three of those holes they found a total of seven stone flakes, indicating aboriginal people were using stone tools in the area. "Flakes are basically your stone chips that you get when you manufacture or sharpen a stone tool," said Ferguson. He said the flakes probably came from a stone knife or arrowhead. "They were probably just going through pursuing some game or something during hunting and sharpened their tools at that location for a short period of time," he said. He said they prove that aboriginal people were hunting in the area hundreds of years ago. He estimates the flakes to be about 600 years old. 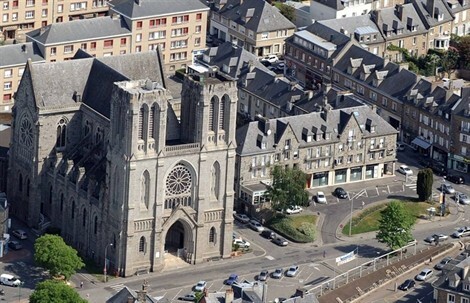 FRANCE – Flers - Quels vestiges renferment encore les places de l’actuelle église Saint-Germain, à Flers (Orne) ? C’est ce que déterminera un diagnostic de l’Institut national de recherches archéologiques préventives (Inrap). Ce travail prescrit par la Direction régionale des affaires culturelles (Drac) doit avoir lieu « dans le courant du mois de janvier 2013, indique Cyril Marcigny, adjoint scientifique et technique à l’Inrap. Il durera une quinzaine de jours. Le rapport devrait être rendu en février ». L’étude vise à retrouver l’emplacement d’origine de l’édifice religieux. Les archéologues pensent également mettre la main sur l’ancien cimetière. USA – San Francisco - Downtown construction crews have unearthed the massive foundations of the old San Francisco City Hall destroyed in the disastrous 1906 earthquake. The wreckage of the old City Hall and its 300-foot dome became a famous symbol of the quake. The San Francisco Chronicle (bit.ly/UCEu32) says workers digging on Hyde Street near Fulton Street for a landscaping project found the City Hall ruins on Sept. 14. Archaeologists from the federal General Services Administration, which owns the adjacent former federal building, were called in to examine the foundations. When the architects and historians are finished documenting the ruins, the construction crews will resume the landscaping project. 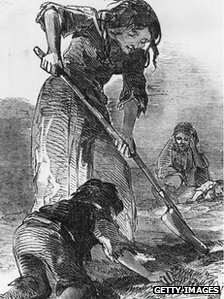 IRLANDE – Hertfordshire scientists have studied 170-year-old potatoes to learn lessons from the 19th Century Irish famine.Potato blight in Ireland in the 1840s caused a food shortage which saw more than one million people die. Rothamsted Research in Harpenden used DNA techniques on samples stored by 19th Century scientists. The research showed how the disease survived between cropping seasons. It will also help test for plant diseases in the future. Potato blight is caused by the microorganism, Phytophthora infestans, which destroys the leaves of potato crops. Professor Bruce Fitt, who led the research, said there had been a further outbreak of the disease about 30 years after the original famine, which sparked a debate about whether it was the same pathogen strain from the 1840s.